This is not a review. I haven’t read Rod Dreher’s The Benedict Option, because I’m depressed enough as it is. However, I’ve heard the book discussed a lot recently. Today Michael Medved interviewed him on his program, and I got a little better picture of Dreher’s argument. It was different from what I assumed. 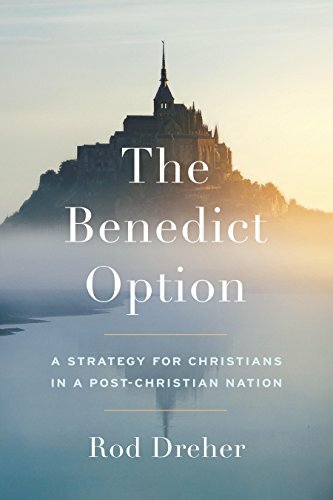 Benedict responded to the decline of civilization by creating communities where the old truths – as well as the old civilizational treasures – could be preserved. It seemed to me that that model wouldn’t work today. Although Benedict lived in hard times, his culture had not turned its back on Christianity as such. He was able to carry on his educational program without officious bureaucrats coming in and shutting him down for crimes against diversity. In the near future, it seems to me, we won’t be allowed to run schools. Not only will we be unable to start institutions, the institutions we have will likely be shut down or repurposed. But in today’s interview, Dreher was clearly aware of those problems. He’s talking about acting in secret, underground ways, and building our faith communities on smaller, more intimate models. Things like house churches. That, it seems to me, is probably how it will have to be. I have no fear that the Church as such will die. It’s Christ’s church, and he will keep it until He returns. I do wonder whether the Church in the west will die. The Book of Revelation warns sharply that Christ will “take away the lamps” of churches that do not hold out to the end. I fear our lazy, selfish, lukewarm churches may have exhausted His patience. It’s certainly a possibility. I’ve been in dozens of churches and heard persecuted Christians mentioned during service once. I take this as a sign that the churches (or at least their leadership) are not greatly stirred up by what’s happening to the eastern churches. Yes, there are numerous organizations looking after precisely that interest. I’m aware of them and support them. But I would have thought even the most formal churches might bring the matter into the service once in a while. In any case, I don’t think that a faint interest in the persecuted is a healthy sign among people whose religion centers on a man who was persecuted and whose followers were persecuted after him.